In the late 1990s, one name was synonymous with a medical doctor-turned-paranormal detective: Dana Scully. Played by actor Gillian Anderson, Dr. Dana Scully made her mark on millions of fans who tuned in every week to watch The X-Files, a hit science-fiction drama that aired on FOX for nine seasons from 1993 to 2002, before returning to TV in 2016. Scully was one of the first multidimensional female characters in a science, technology, engineering, and mathematics (STEM) field to be featured on a popular television show, and the first to play a leading role. She is known for her objectivity, skepticism, confidence, and brilliance. In the world of entertainment media, where scientists are often portrayed as white men wearing white coats and working alone in labs, Scully stood out in the 1990s as the only female STEM character in a prominent, prime time television role. This report presents the findings of the first systematic study of the influence of Dana Scully on girls and women pertaining to STEM – the “Scully Effect.” The primary questions of this research are whether Scully’s character improved women’s perceptions of STEM fields, whether she inspired girls and women to go into a STEM profession, and whether female viewers see Scully as a role model. This study was conducted by 21st Century Fox, the Geena Davis Institute on Gender in Media, and J. Walter Thompson Intelligence. In the 1990s, Scully was a sharp departure from the gendered stereotype of a scientist. Her character blends traditional norms of femininity and masculinity to portray a brave, even-keeled field agent who serves as a counter-balance to her quirky and sometimes erratic partner, Fox Mulder. She is the logical and skeptical half of the duo, constantly defying the ‘damsel in distress’ stereotype by saving the day with her wits and weapon. Scully’s media depiction of a high-achieving woman in STEM asked a generation of girls and women to imagine new professional options. Commentators have speculated about the “Scully Effect” for two decades – the term coined for this phenomenon – but this is the first research study to evidentially confirm it. Women in our study report that Scully’s character influenced their perceptions of, aspiration for, and involvement in STEM. Beyond paving the way for other characters like her in media (e.g., Bones’ Dr. Temperance “Bones” Brennan, Veronica Mars, Alias’s Sydney Bristow, and Firefly’s Zoe Washburne10), Scully also influenced a generation of young women to study and pursue careers in STEM. About one-third (29%) of respondents were aged 25 to 39, while the remainder (71%) were aged 40 or older. Roughly half (49%) of the sample studied a STEM field in college, or currently works in STEM. Two-thirds of respondents (68%) had seen at least one episode of The X-Files, which speaks to the show’s wide reach. Throughout this report, we break our analysis into two primary groups: non/light viewers (61% of the sample) who have watched fewer than eight episodes and medium/heavy viewers (39% of the sample) who have seen the show eight or more times. This breakdown allows us to isolate the impact of viewing The X-Files on a regular basis. All differences reported here are statistically significant at the .10 level. We find significant evidence of the “Scully Effect” when it comes to attitudes toward STEM, working in a STEM field, and viewing Scully as a role model. We analyze each of these topics in turn. Women who are medium/heavy watchers of The X-Files hold more positive views of STEM than non/light watchers, and several survey questions link this directly to the influence of Scully’s character. Nearly two-thirds (63%) of women who are familiar with Dana Scully say she increased their belief in the importance of STEM. A greater percentage of medium/heavy viewers of The X-Files strongly believe that young women should be encouraged to study STEM than non/light viewers (56% compared to 47%). Medium/heavy viewers are significantly more likely to strongly agree with the statement “I would encourage my daughter/granddaughter to enter a STEM field” than non/light viewers (53% compared to 41%). Medium/heavy viewers are more likely to strongly agree with the statement, “If I could go back and do it again, I would have studied or worked in an industry that is STEM” than non/light viewers (27% compared to 17%). Women who regularly watch The X-Files are more likely to express interest in STEM, major in a STEM field in college, and work in a STEM profession than other women in the sample. Among women who are familiar with Scully’s character, half (50%) say Scully increased their interest in STEM. Medium/heavy viewers are 43% more likely than other women to have considered working in a STEM field than non/light viewers (40% compared to 28%). Medium/heavy viewers are 27% more likely to have studied STEM than non/light viewers (28% compared to 22%). Medium/heavy viewers are 50% more likely to have worked in a STEM field than non/light viewers (24% compared to 16%). Most of the women in the sample consider Dana Scully to be a role model for girls and women, and women who work in STEM are particularly likely to see her this way. Among women who are familiar with Scully’s character, 91% say she is a role model for girls and women. Nearly two-thirds (63%) of women that work in STEM say Dana Scully served as their role model. Among women who are familiar with Scully’s character, 63% say Scully increased their confidence that they could excel in a male-dominated profession. Nine out of 10 (91%) women who are familiar with Scully’s character say she stands out as being a strong female character on television. 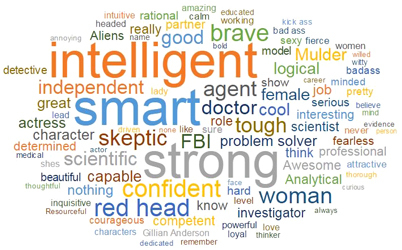 Women in the sample were asked about various attributes of Scully’s The most frequently used words to describe her were “smart,” “intelligent,” and “strong” (see word cloud below). When it comes to attitudes toward STEM, regular viewers of The X-Files have far more positive beliefs about STEM than other women in the sample. Moderate/heavy viewers place a higher priority on encouraging girls and women to go into STEM than non/light viewers, and nearly two-thirds of regular viewers say that Scully increased their belief in the importance of STEM. Beyond attitudes toward STEM, the “Scully Effect” is also found in behaviors relating to STEM. Women who regularly watch The X-Files are significantly more likely to have considered going into a STEM career, majored in a STEM field in college, and worked in a STEM profession. Among women who are familiar with Scully’s character, half of them say Scully increased their interest in STEM. A vast majority of women who are familiar with Scully’s character on The X-Files say she is a role model for girls and women, and nearly two-thirds of women who work in STEM say that Scully served as their personal role model. When asked about the impact of Scully’s character, most women in the sample agree that Scully is a strong, smart, and intelligent character who increased their confidence to excel in a male-dominated profession. Photos are courtesy of Twentieth Century Fox Film Corporation. All Rights Reserved. Diekman, A. B., Weisgram, E.S. and A. L. Belanger (2015). “New Routes to Recruiting and Retaining Women in STEM: Policy Implications of a Communal Goal Congruity Perspective.” Social Issues and Policy Review, 9(1): 52–88. Ceci, S. J., Williams, M., & S.M. Barnett (2009). “Women’s Underrepresentation in Science: Sociocultural and Biological Considerations,” Psychological Bulletin, 135: 218–261. Thomas, M. D., Henley, B., & C.M. Snell (2006). “The Draw a Scientist Test: A Different Population and a Somewhat Different Story,” College Student Journal, 40(1): 140–148. Steele, J. (2003). “Children’s Gender Stereotypes about Math: The role of Stereotype Stratification.” Journal of Applied Social Psychology, 33(12): 2587–2606. Cvencek, D., Meltzoff, A. N., & A.G. Greenwald (2011). “Math- Gender Stereotypes in Elementary School Children.” Child Development, 82(3): 766–779. The use of conventional random sampling was not an option for this study given that only about 1% of women in the S. work in a STEM profession, and about 3% of women in the U.S. watch The X-Files. The size of the random sample required to draw accurate conclusions about these two subpopulations would have been time and cost prohibitive. Thankfully, oversampling is a valid and reliable way of getting more accurate results by reducing the margin of error for smaller subpopulations. (The margin of error decreases as the sample size increases, so oversampling a subpopulation reduces sampling error and allows us to more accurately determine if differences pertaining to the group are statistically significant.) We deliberately included more women in STEM professions and viewers of The X-Files in the sample to get a statistically significant survey for that group, then we weighted down to ensure that the oversampling of each group did not skew the findings. Artz, L. (2015). Global Entertainment Media: A Critical Introduction, New York: Wiley-Blackwell.